Our latest blog ended October 1 with The WannaBeatles returning to Nashville after a gig in Aiken, S.C. But that Saturday wasn't a normal trip back home. Bloggin' Bryan stopped in Atlanta to visit his mother in the hospital. That turned into a memorable visit. 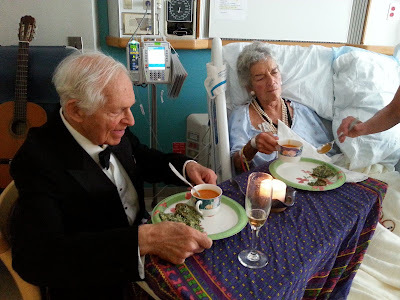 The next day Mother and Daddy's celebrated their 68th anniversary, October 2, in the hospital. "PaJoe" and "Embo" in formal wear, with special candle lit dinner of spinach quiche, lobster bisque, and champagne, celebrating their anniversary. Looking back on it now, at the end of the year, that visit was the beginning of the end, a season for a vibrant woman who lived 90 exciting years to enter a stage of peaceful withdrawal, with enough time to say goodbye to everyone she loved before making a final exit just after Thanksgiving. That is part of why these blogs have been neglected over the last few months. It's interesting to see the different paths that our lives take between the times we get together. Gigs bring us together, and we enjoy working together, then we return to our homes, our families, our lives. Sometimes that includes parents dying. Dennis lost both his parents over a three month period less than two years ago. Last year, we were playing a gig in Cadiz, Ky. when David lost his father, and had to take an immediate flight to Florida, and The WannaBeatles had to find another drummer for a gig the next day. When this band started out, all our parents were alive and well. We've been with each other through all these experiences. And along with the losses, we experience joy together, sometimes unexpectedly. The same trip that took Bloggin' Bryan to Atlanta included a memorable example of being entertained by a rare case of Nathan's spontaneity. WannaBeatle Nathan is normally a very reserved guy. He's definitely the quietest member of the band. That's what makes it especially enjoyable for us when he turns loose and lets himself go, as he did that morning we were driving back from Aiken. "Who Put the Bomp (in the Bomp, Bomp, Bomp)" is a classic novelty song from 1961, about a guy who's grateful for the silly doo-wop songs that made his girlfriend fall in love with him. We put our google to use and discovered it was written by Barry Mann (along with Gerry Goffin) and performed by Barry Mann. We have no idea why this particular song struck a nerve in Nathan's earnest New England soul, but we were delighted to witness the result of his inspiration. Now that we've witnessed Nathan's performance of "Who Put The Bomp" (while wearing a seat belt), we are more certain than ever that there is no band anywhere quite like the WannaBeatles. We're grateful for that and plan to keep it that way.